When we decided to move to Granada for our year in Spain we discovered there were few resources to aid the complex process of moving country. Drawing on what we learned and by helping other families, it is our passion to assist you in creating a positive and smooth arrival in Spain. ﻿​Where to begin for a move of this kind? 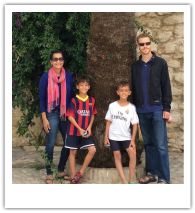 ​"Bianca helped our family realize our dream of living in Spain. We draw on our experience and knowledge to provide a tailored service as we understand each family is different. Feel free to contact us to arrange a Skype call or email advice.